People moving to a different home often have a lot of questions about moving companies and how they work. That’s good! Zippy Shell is happy to provide you with the details you need to make your move a success. Take a look at our guide on how the process works and what you need to know when planning out transportation. There are several sizes of Zippy Shells that you can choose from, varying from smaller sizes ideal for college students up to moving sizes that are more suitable for homes and long-distance moving. Choose the size that is right for you, and provide us with your address change and what time you need the Zippy Shell to be delivered and re-delivered. Then your shell is on the way! Note that the average shell is about the length of two cars, so it’s important to have this space ready. Once the Zippy Shell arrives, you will have three days to load it up with the necessary belongings. After three days (or if you contact us and let us know you only need one or two days), we will come back and pick the Zippy Shell back up. Because of this three-day deadline, it’s important that you have your moving strategy ready to go when your shell shows up. We can provide blankets and boxes if you need them, so let us know! When we retrieve the Zippy Shell, we bring it to our secure, climate-controlled indoor facility for safekeeping. If you are worried about the state of your belongings, we do offer insurance that you can purchase as an added guarantee. Note that we store belongings for up to 30 days free of charge, but after this period fees will be applied for extended storage. Moving plans can get a little hectic, so it’s a good idea to contact us and confirm the right transportation time to deliver a shell to your address when everything is lined up. Note that the re-delivery fee, when the shell is dropped off, is the same as the delivery fee, although it’s the second stage of the service. You are not being charged twice for the same thing! You will have another three days to unload the Zippy Shell at your new address. Remember, if you need any help unloading your items, let us know, and our professionals can help out! 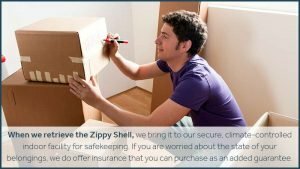 If you face the stress of moving and storing belongings in your next big move, make things easy on yourself and contact Zippy Shell Greater Columbus. Here’s how to get free quotesfor both moving and storage!